This GMT designed and manufactured custom dash cover will go a long way in adding a luxurious appearance to your gas or electric G14, G16, G19, G20, G21 and G22 Model Yamaha Golf Carts. These are high quality, beautifully detailed GMT designed and manufactured thick gauge, quality covers that are not to be compared with thinner, cheaper products that will break easily. These covers snap right over your present dash set up and are secured with screws. They feature lockable doors on either side of the dash, (hardware and keys are included), are designed to allow for a dash mounted radio, and allows you to see the factory ball holders. If you would like to add a radio to your golf car, no problem there is an adapter available for the Yamaha G14-G22 Models. The adapter plate fits in the drivers side door only. Just make your selection in the option menu. 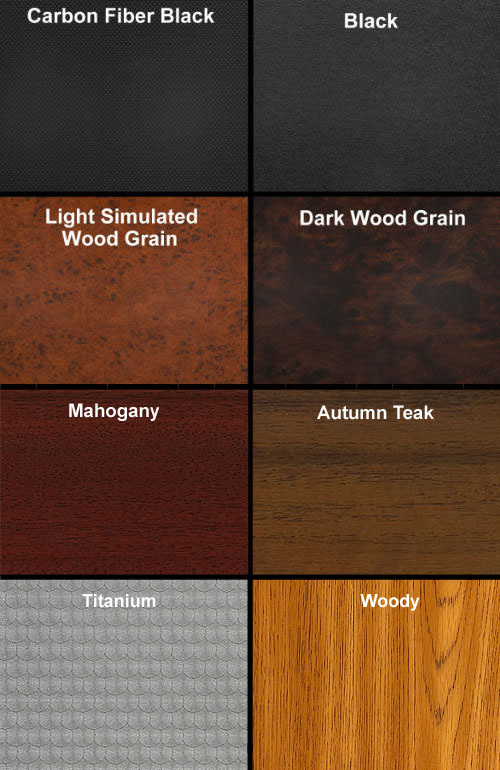 These covers are available in a variety of finish options listed below. You may click Related Documents to see sample of the color choices (exceptions noted below). Note: These dashes can be customized. For example, if you would like the dash in one finish and the lockable doors in another, we can make that happen. Please just give Golf Car Catalog a call at 1-800-328-1953, let us know, and GMT will be happy to custom make your dash at no extra cost. However, please note that this is a special order and therefore can not be returned. Note: These dash covers are not designed for the newer Drive Model Yamaha Golf Carts made from 2006 to present. If you have questions about your year and model, please call Golf Car Catalog at 1-800-328-1953 for assistance.